Brad Gushue’s life-long pursuit has finally ended. The 36-year-old St. John’s native and his Newfoundland/Labrador teammates beat Kevin Koe and Team Canada 7-6 Sunday to win his first Tim Horton Brier title before a sellout audience of 6,471 screaming fans who filled Mile One Centre. 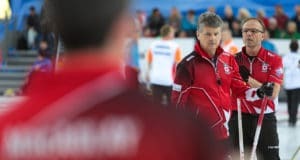 The win ended years of personal frustration for the 2006 Olympic gold-medallist who had failed to win the title in 13 previous Tim Hortons Brier appearances. “To win a Brier, my whole team, myself and Mark (Nichols) have been so close so often, just so emotional to hug him afterwards,” said Gushue, who fought back tears as he hugged teammates and his family as fans exploded into ovation after ovation. They almost didn’t get to celebrate, however. Gushue needed a strong sweeping effort by second Brett Gallant and Nichols to drag his last rock draw into the eight-foot for the winning point. Nichols came out of the house to sweep in place of lead Geoff Walker, who couldn’t because of a right shoulder injury. “It was incredible. I threw that a little lighter than I wanted,” said Gushue. “When it was coming down it looked like it was going to be there and only got there by a little bit. Gushue and Co., scored three in the second end and two in the fifth for a 5-1 lead. But Team Canada came fighting back with three in the sixth and one in seven to tie the game. That shot was a pick of Koe’s counter between three Newfoundland/Labrador stones in the four-foot and turned a possible steal into a single for Gushue. Walker said the team didn’t panic when Canada came back to tie the game and put pressure on Newfoundland/Labrador. “We still realized we were in control of game, we had hammer,” he said. “We had three ends to go and two hammers to one. We just reminded ourselves, we’d have taken that if someone told us at the start of the day. The win was the perfect ending to the first Tim Hortons Brier in Newfoundland/Labrador in 45 years. Loud capacity crowds had attended every Gushue game and were primed for their hometown hero to bring the Tim Hortons Brier title back to Newfoundland/Labrador, which has won only once before – Jack MacDuff in 1976. The win earns Gushue’s team total of about $225,000 in prize money and Sport Canada funding over the next two years. 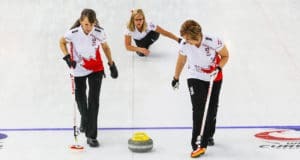 It also earned them a spot in the Ford World Men’s Curling Championship in Edmonton April 1-9 and direct entry into the 2018 World Financial Group Continental Cup in London, Ont., Jan 11-14 and the 2018 Tim Hortons Brier in Regina, March 3-11. 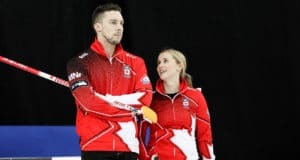 If Team Gushue — make that Team Canada — wins a medal at the Ford Worlds next month, it also gets a direct-entry berth into the 2017 Tim Hortons Roar of the Rings Canadian Curling Trials in Ottawa Dec. 2-10, when Canada’s four-player Olympic curling teams will be decided. They also earned 83.558 Canadian Team Ranking System points. Koe, third Marc Kennedy, second Brent Laing, lead Ben Hebert, alternate Scott Pfeifer and coach John Dunn earned $45,000 and 65.652 points. In the bronze-medal game earlier, Mike McEwen of Manitoba (Winnipeg) executed a straight forward hit and stick for two in the 11th end to beat Brad Jacobs of Northern Ontario (Sault Ste. Marie) 7-5.